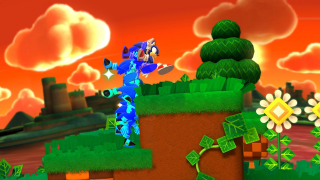 Sonic using Parkour to climb terrain in Windy Hill. Parkour is a moveset used by Sonic the Hedgehog in both the Wii U/PC and 3DS versions of Sonic Lost World that allows Sonic to perform acrobatic stunts he has never demonstrated before, based on the real-life stunts, though many of these moves have actually been seen before in other games. Gameplay-wise, it lets the player run, climb and jump on walls. Sonic cannot use Parkour when using the Spin Dash, though. The most basic of Parkour moves, the Wall Climb allows Sonic to run up almost all walls; those coloured black and white cannot be climbed. To perform this move, the player must run towards the wall they want to climb. The player can only travel so far up the wall before they slip and fall, but they can perform a Spin Dash for an extra boost; however, it can only be used once per Wall Climb. The player can also press the Duck button to cling to the wall and slide down slowly. When performing the Wall Climb and there is a nearby wall to the left/right, the player can press the Jump button to jump from wall to wall. When performing the Wall Climb in 3D movement and the player needs to reach the left/right of the same wall they are climbing, they can press or to side step in the direction they desire. This move allows the player to run perpendicular on walls in 3D movement for a limited time. To do this, they have to jump to a wall during a Wall Climb, jump into a wall at a diagonal angle or use a Speed Booster to boost their way into a Wall Run. If the player needs an extra boost to get through, they can use a Spin Dash to go faster. This page was last edited on 23 March 2018, at 19:27.